In about one month’s time, I was met with these scenarios without looking for them. What would you do when you come across a dog in a car on a hot day? On a beautiful sunny 85+ degree day at the L’Oreal “Because Your Dog Is Worth It Too” event – amongst avid dog loving people – someone left their dog in the car. It seems especially in an environment such as that, someone wouldn’t even think of doing that, but it happens. The organizers made several announcements, notified authorities on the premise, and a mob of people were just waiting to see who’d come up to the booth to claim they did this. The person avoided the booth, went to their car met by police where the dog was treated by a vet. Another time, I was in a Walmart parking lot on an 80-degree day when I heard a dog whining from a van with the back windows slightly cracked. When I peeked in to see the small dog in an enclosed crate, someone passing by said to me, “That dog was barking when I went in a half hour ago.” I immediately went in to the store to have them call for the owner over the speaker, but in hindsight I should have called 911 at the same time. The owner said he was in the store only 5 minutes and the dog is always okay (noting this wasn’t the first time). On a different day when the temperatures was 100 degrees, as I was walking into a store I came across a dog in a car with the windows slightly cracked. I inquired in the store if anyone owned that car, but no responded. They suggested I go next door to the restaurant. I gave the license and make of the car there too, but all the patrons seemed engaged in their meals. This time I went back out to the car and called 911 as the dog was panting. But, what happened next surprised me. The dispatcher didn’t seem to want to call out a patrol car on this. When the police did arrive, I was told there was no law against this and it wasn’t animal cruelty as the windows were cracked. I did get to meet the owner who was having dinner in the restaurant meanwhile. I shared with him the info in this blog and asked him to please not leave his dog in hot temperatures again. Then, even at a family reunion, one of my cousins knowing I love dogs tells me how her friend’s dogs coincidentally died of seizures (two separate times) during a yearly event. At first, I thought “Oh, that’s strange.” Then, as she told me more about the event, I asked if this man would leave his dogs in the car – sure enough he would. A seizure can be the result of a heat stroke leading to death. A pet can quickly suffer brain damage or die from heatstroke or suffocation when trapped in high temperatures. Well-meaning people who want to bring their dogs with them while shopping or running errands aren’t realizing the danger of a hot vehicle – that their pet may end up suffering — or even dying — due to the effects of heatstroke . You know the saying; “I’m roasting in here” is how a dog feels left in a car on a hot day and even a slightly hot day. Even on mild days, with temperatures in the low to mid-70’s, the temperature inside a parked car can quickly reach 100 degrees. In warmer, 85-degree weather, temperatures can reach 120 degrees within a half hour, even if a car window is left open a crack. It is cruel, but not illegal. But even then the term “cruelty” seems to depend on who who’re talking to. Leaving a dog unattended in a vehicle under conditions that endanger the health or well-being of an animal due to heat, cold, lack of adequate ventilation, or lack of food or water, or other circumstances that could reasonably cause suffering, disability or death is finally going on the law books as a crime in some cities. In Los Angeles where leaving a dog in a vehicle that results in a dog’s death, it’s a crime that carries with it up to six months in jail in L.A. (Penal Code 597.7). But, law or no law, more awareness is needed. And, parking in the shade doesn’t mean that the vehicle is not too hot for your pet. Unless you are sure you can bring your pet into the store, or business (call ahead to find out), it is best to leave your pet at home when it is warm out. 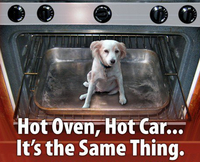 If you see a dog left alone in a hot car, try to locate the owner, notify on-site security personnel, and/or call 911. Find out if it’s against the law in your town. But even if it isn’t you may need to take some kind of action such as calling 911 to help the dog out of the situation. In my area, even though it’s not against the law, I told the officer I will call again.